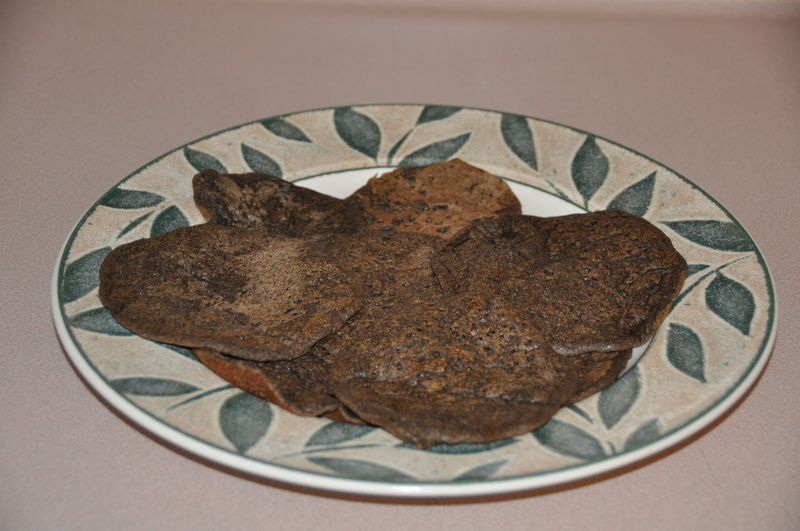 Because he humors me, Mike agreed to another breakfast-for-supper night and we made Yeast Buckwheat Cakes tonight. 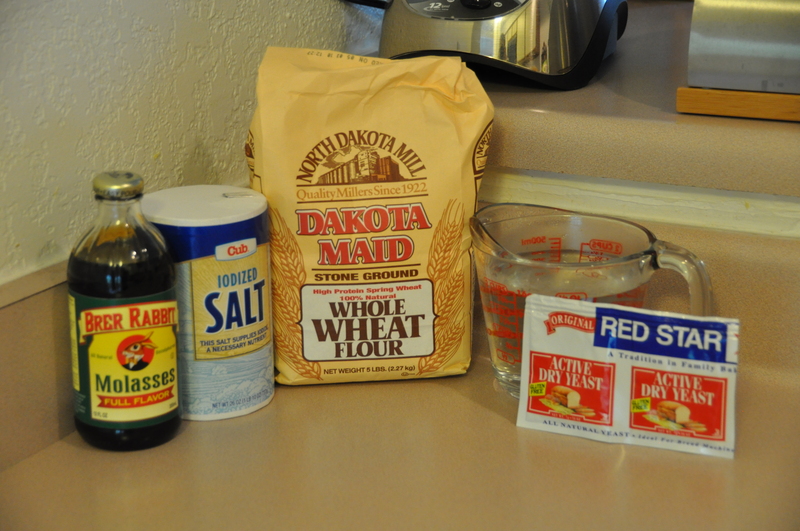 Beard, foolishly assuming that you’re going to have your Yeast Buckwheat Cakes for breakfast, tells you to mix the flour, salt, water, and yeast together the night before. I mixed them together before I left for work, and let the mixture ferment all day. When it was time for dinner, I added the baking soda, molasses, and melted butter. My pancake-pouring technique is improving–many of my buckwheat cakes were impressively round. 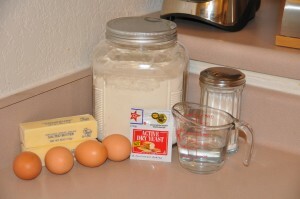 This recipe makes a lot of pancakes (the picture above is only about one-third of the batch). Beard claims it yields “about 20 small pancakes.” To me, 5 inches in diameter is not a “small” pancake. Keeping in mind how sick I got from eating almost an entire batch of Yeast Griddle Cakes, I paced myself. 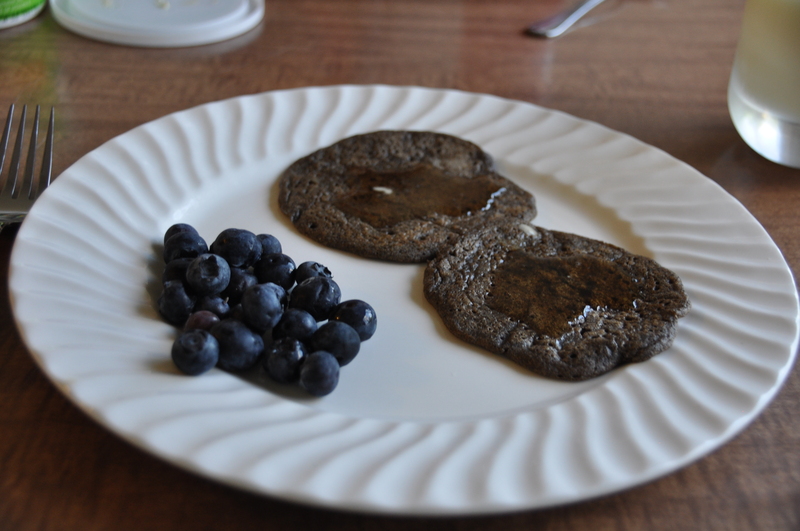 It was difficult, because Yeast Buckwheat Cakes are fabulous. 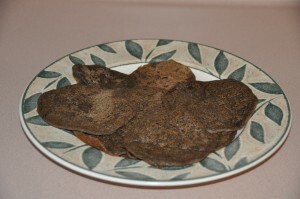 The buckwheat flour provides a nutty, savory flavor, and there is a hint of sourdough from the fermenting process. Since I wanted to be thorough, I tried one with butter, one with strawberry jam, and one with maple syrup. And then another one with maple syrup, and another, and another…and they were all delicious. Mike and I spent our honeymoon in Ireland, so I have a soft spot for anything Irish. Not only is this recipe Irish, Myrtle Allen’s Brown Bread is also a wonderful weeknight bread because there is no kneading and only one rising. 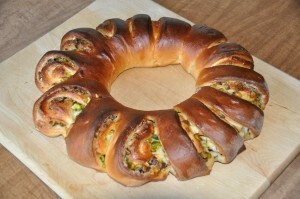 The recipe can be found on the James Beard Foundation’s website. 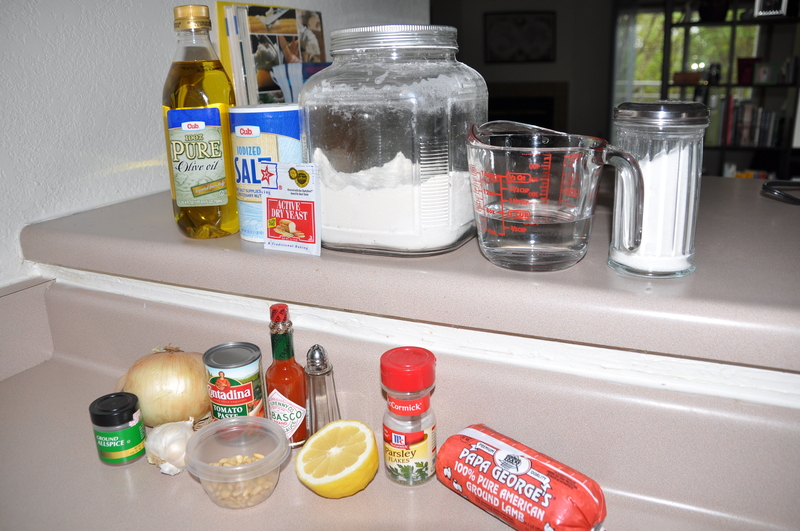 I used one-third less salt than the recipe called for–2 teaspoons instead of 1 tablespoon. 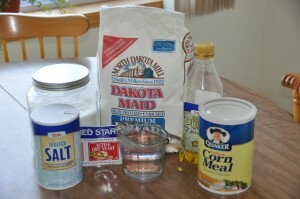 An unusual step in this recipe is heating the flour and bowl before mixing the ingredients together. I’m not sure what this accomplishes, but I set my oven to “warm” and let the flour heat up while I let my yeast proof. After about 10 minutes, the flour was warm and the yeast had bubbled up nicely, soI mixed everything together. 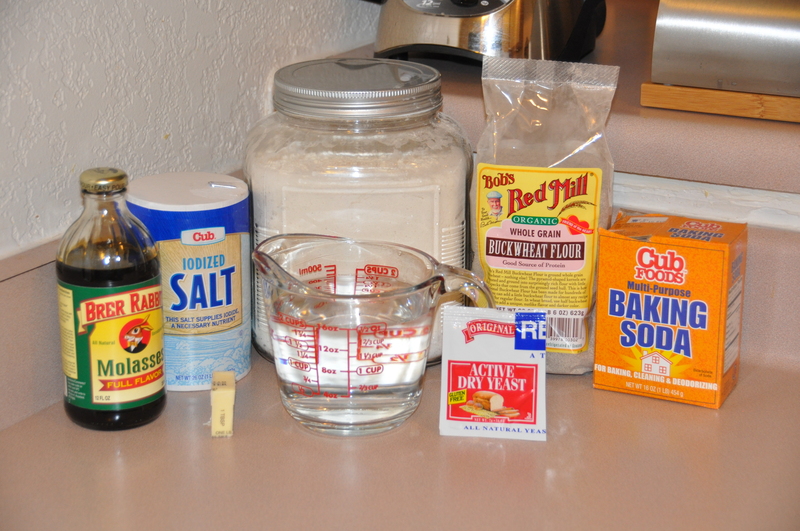 My dough was moist and sticky after adding two cups of water total to the flour, as called for by the recipe. 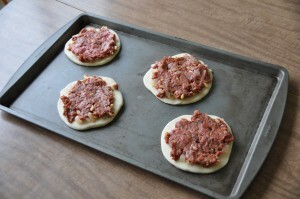 I spread the dough into my 9 x 5 pan and let it rise for 45 minutes. The recipe recommends a baking time of 50 minutes at 450 degrees, or “until the crust is nicely browned and the loaf sounds hollow when tapped.” By that measure, my bread was done after only half an hour. Biting into a fresh slice of Myrtle Allen’s Brown Bread was being back at an Irish bed and breakfast. The bread has a thick, crispy crust, a robust texture, and a delightfully simple, honest flavor. I was curious to see if Ballymaloe House is still in existence. It most definitely is, and Myrtle Allen still works around the house. I hope that she’s still wowing guests with her amazing brown bread. 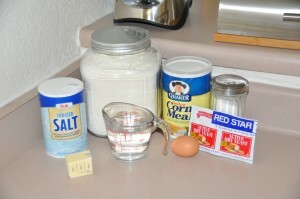 After last night’s disappointment, I wanted to make something delicious for breakfast this morning. I chose Girdle Scones for their simplicity and the fact that there is absolutely no butter in the recipe. Unfortunately, due to some technical difficulties none of the pictures I took saved to the memory card. The ingredients for this recipe were flour, salt, sugar, cream of tartar, baking soda (because my alertness level is never very impressive before breakfast, I accidentally used baking powder instead of baking soda. It didn’t seem to make much of a difference), and buttermilk. Usually I substitute milk with lemon juice for buttermilk. 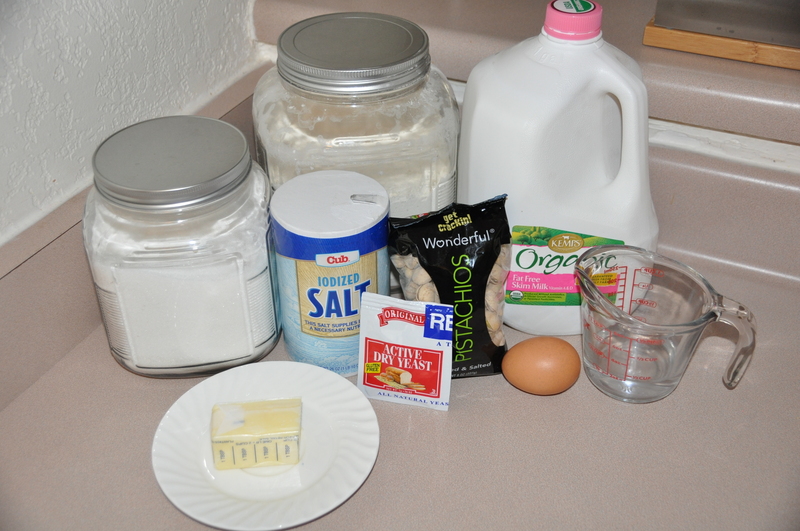 This time, I used real buttermilk, and what a difference it made–the flavor was incredible! Beard doesn’t specify how much buttermilk to use, just “enough…to make a soft dough.” I used the entire 8 ounce container, along with an extra half teaspoon of water, to get the right consistency. 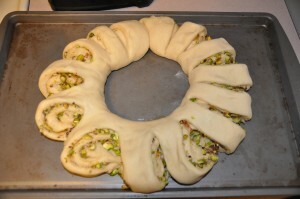 I divided the dough in half, rolled each half into a circle about 6 inches in diameter, and cut the circle into quarters. I cooked the dough wedges on the griddle on medium heat for 10-15 minutes. They developed a nice crunchy layer outer layer and were soft and chewy on the inside. As recommended by Beard, we ate them hot, split, and spread with jam (although it was strawberry instead of raspberry). How did they taste? 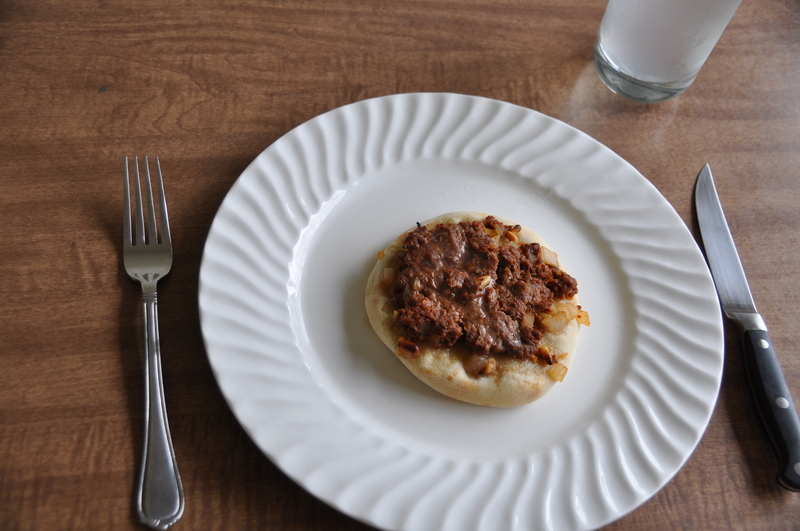 Like an English muffin with buttermilk flavor and amazing texture, only much, much better. 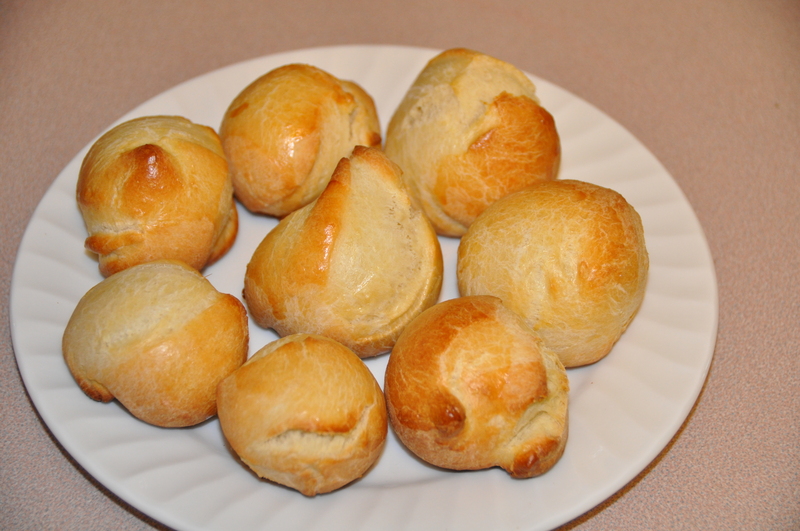 For some reason, I have a hard time pronouncing the word “brioche.” Besides a bread, it is also a knitting stitch (my other hobby) so I have lots of opportunities to mangle the pronunciation. 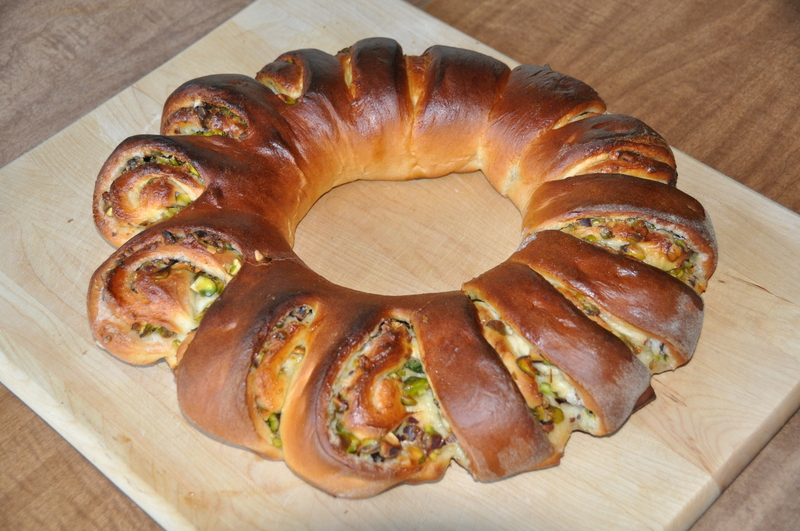 Luckily, this bread is easier to make than to say. Note the two full sticks of butter (one is hidden by the eggs). These will be important later. 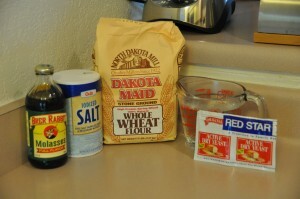 Since I used salted butter, I eliminated the salt in the recipe. Brioche is unique in that it does not require any kneading. I simply melted the butter, mixed it with the yeast, sugar, water, eggs, and flour, and let the dough rise. 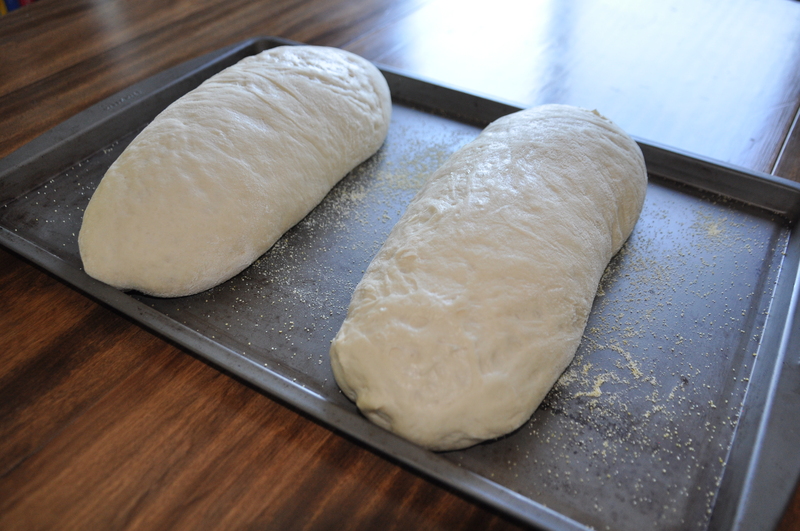 After an hour, I had to “shape into loaves.” Fine, I thought, I’ve done this before. Then I picked up the dough. It was the consistency of a giant grease ball. 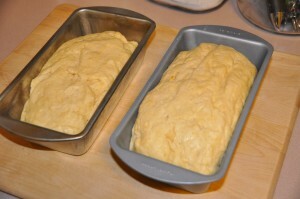 I pulled the oily mass into two pieces, wadded each one into an approximate loaf shape, and put them in pans to rise again. After about 45 minutes, they had doubled in size and were ready to be baked. The bread was done after 25 minutes in the oven at 400 degrees. 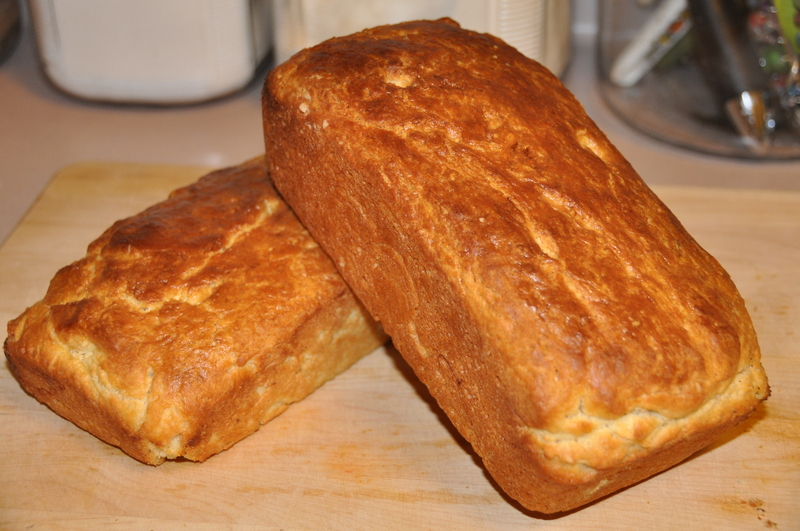 Now, I like butter as much as the next person (see: Helen Evans Brown’s Corn Chili Bread). However, Brioche Bread tasted more like butter with some flour mixed in than bread. It was edible when spread with homemade jam, but I couldn’t stomach it plain. And the idea of a slice of Brioche Bread with butter makes me feel ill.
My blog has been down for a few days due to a server upgrade, so I’m a little behind in posting. 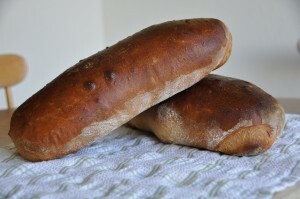 On Sunday, I baked some Italian Feather Bread for Monday night’s dinner of paninis on the George Foreman grill. 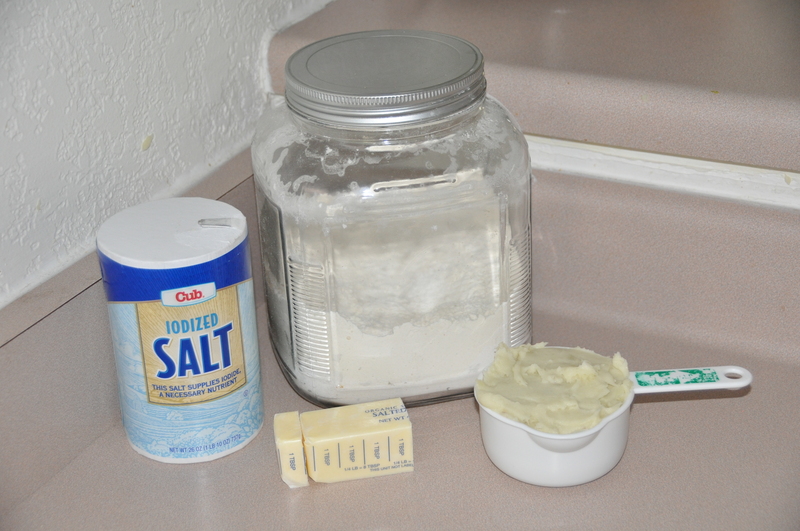 I decreased the salt from 2 teaspoons to 1 ½ teaspoons, since I used salted butter. This bread is similar to French-Style Bread in that it only has one rising, which takes place after the dough has been shaped into loaves. My loaves look much more even this time, thanks to a different loaf shaping method: I divided the dough in half, rolled each portion out into a rectangle, and then rolled the rectangles up into loaves. 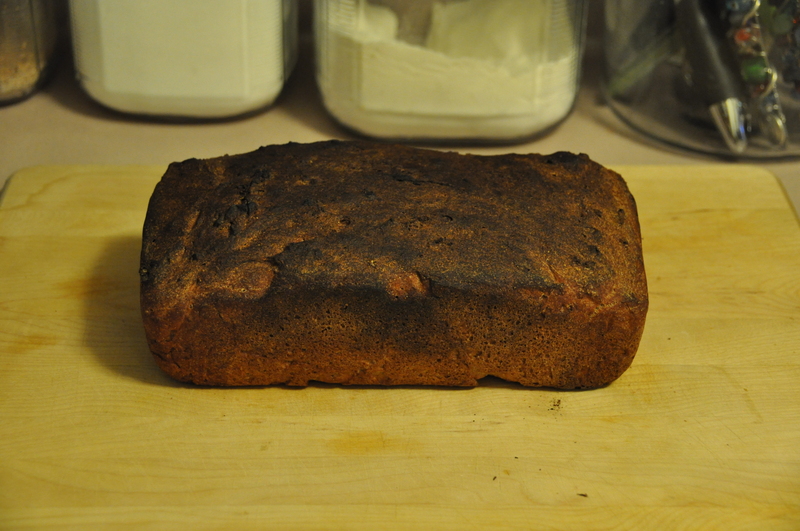 After half an hour in the oven at 425 degrees, the loaves were a lovely dark brown color. We ate most of one loaf fresh out of the oven (of course), and it was absolutely delicious. Italian Feather Bread lives up to its name, with a light, airy texture. We did manage to keep our hands off the other loaf until Monday night, and had an excellent panini dinner. Pitas are the only commercially produced bread that I’ve bought since starting this project. 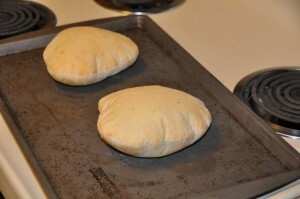 I was in the mood for some beef pita pockets and vegetarian pita pizzas for dinner this week, so on Monday night I decided to try making some pitas myself. 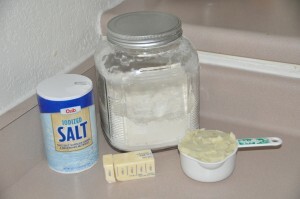 Because Beard’s recipes run on the salty side, I cut the amount of salt in half from one and a half tablespoons down to three quarters of a tablespoon. 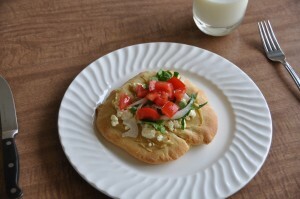 Pitas are rather time-consuming. 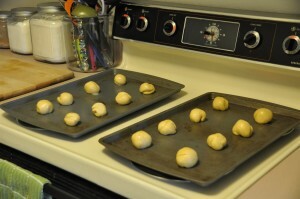 After letting the dough rise for an hour and a half, I divided it into 8 small balls and then let those rise for a half hour. Then, I rolled each ball out into a circle (some of which were more circular than others) and let the circles rise for another half hour. Finally, it was time to put the pitas in the oven. 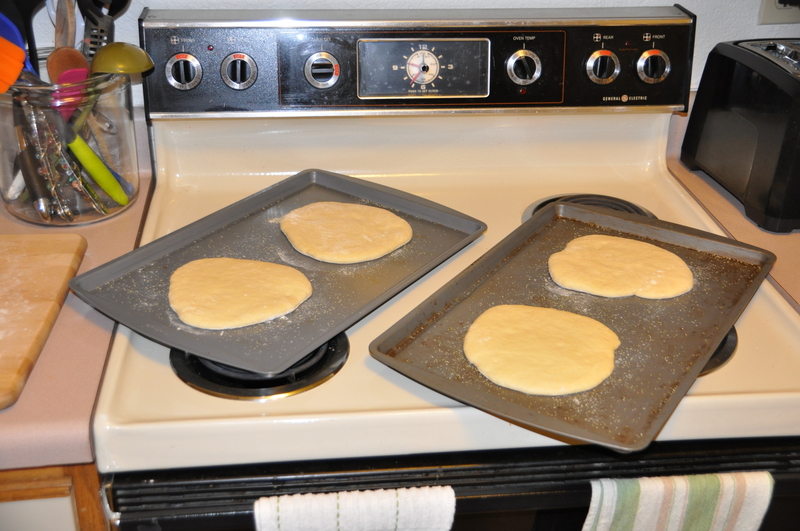 Since I don’t have two ovens, or an oven large enough to fit two cookie sheets in it at once, I had to bake the pitas two at a time. This recipe requires a bit more finesse than the bread recipes I’ve tried to this point. Per instructions, I set the oven at 500 degrees. For the first batch, I baked them on the bottom shelf for 5 minutes (per Beard) and on the top shelf for 2 more minutes (Beard recommends three to five minutes, but my oven runs hot). 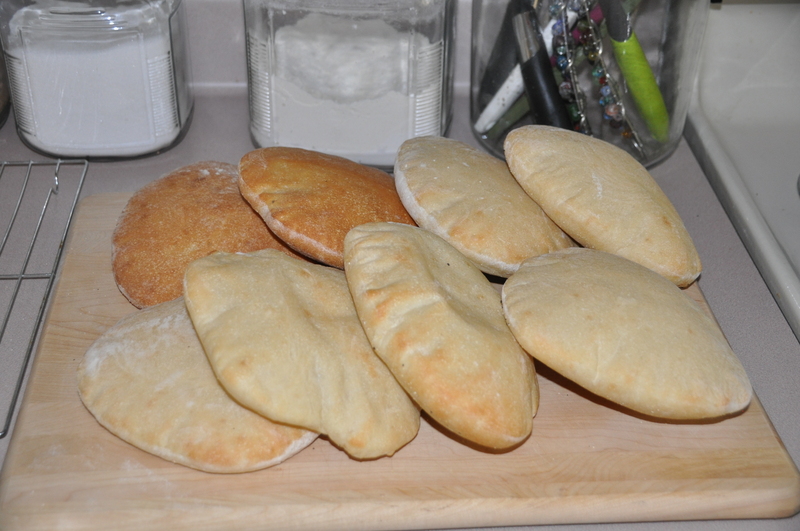 The pitas came out a little over-browned. 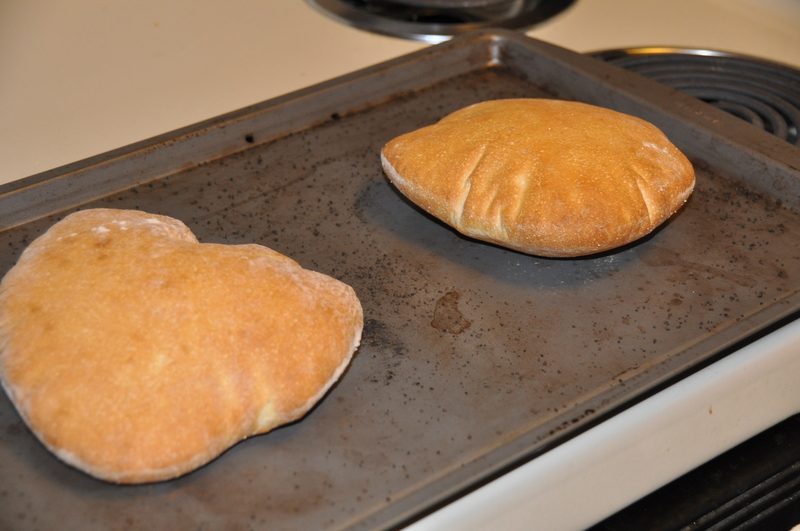 For my second attempt, I took the pitas out of the oven after their five minutes on the bottom shelf. This was much more successful: the pitas were “puffed up like balloons and just very lightly browned” as Beard says they are supposed to be. The next morning, the pitas had mostly deflated. I saved sampling them until today, when we made pita pizzas with hummus, feta cheese, spinach, tomato, and onion. The texture was perfect–soft and spongy. The flavor was excellent as well, so cutting the salt amount in half was definitely the right decision. 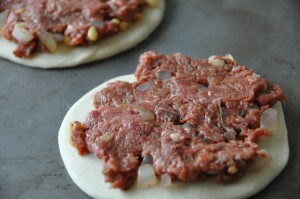 I’m already looking forward to the beef pita pockets we’re making tomorrow night with the rest of the batch! After last week’s five-and-half-hour adventure baking Carl Gohs’ Bread, I wanted to bake something easy this Sunday. 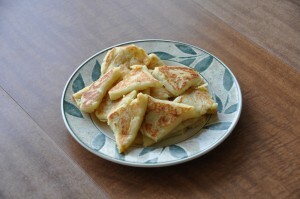 Potato Scones fit the bill: no rising time, four ingredients, and a cooking time of five minutes. 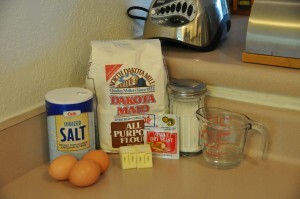 Here are the four ingredients: flour, salt, butter, and mashed potatoes. I think it took longer to make the mashed potatoes than make the actual scones themselves. 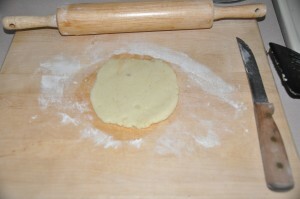 After mixing the ingredients to form a dough, I divided it into thirds and rolled each third into a circle. Then I cut each circle into sixths and cooked the pieces on a griddle. My first “circle” was more of a square, but the third attempt was somewhat round. The scones had an intriguing texture–fluffy but doughy at the same time. The potato flavor was good, but I would definitely cut the amount of salt down from one teaspoon to a half teaspoon. 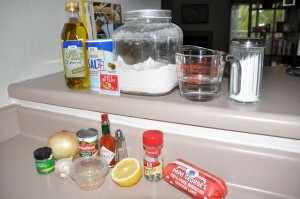 Overall, this was quick, easy recipe and would make an interesting side dish. My family is visiting over Mother’s Day weekend, so I wanted to make a company-worthy bread. I settled on making Pistachio Bread as a sweet dessert bread to have after dinner on Saturday. Because I’m cheap, I bought the in-shell pistachio nuts that were on sale and then shelled them all myself. The eight-ounce bag of in-shell pistachios yielded exactly the one cup of shelled, chopped nuts I needed for the recipe. 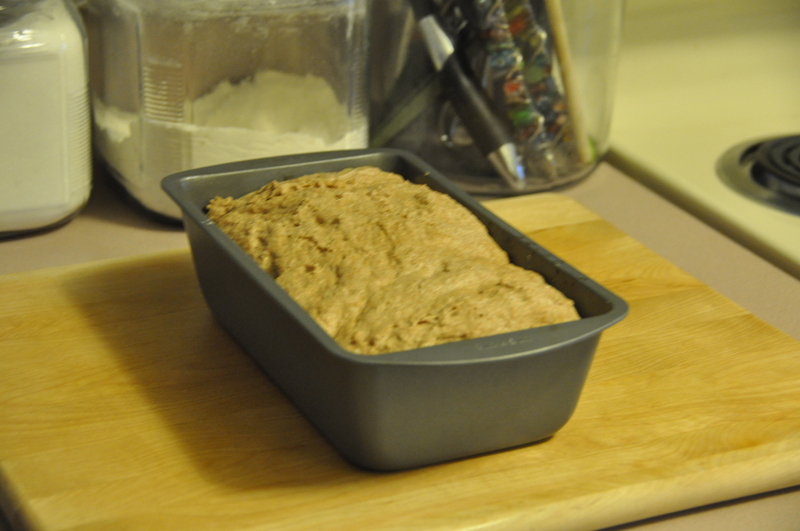 The bread began like a typical loaf–I mixed the ingredients together, kneaded the dough, and let it rise. After the first rising, things got a bit more complicated. I rolled the dough out into a rectangle, brushed it with melted butter (2 tablespoons, rather than the 4 tablespoons called for by the recipe, was more than sufficient), and sprinkled the dough with sugar and the chopped pistachios. 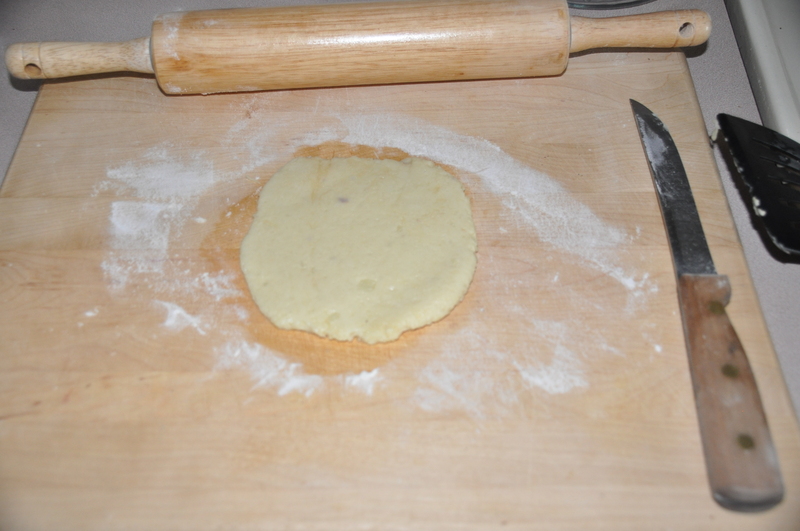 Then I rolled the dough up and joined the ends to make a circle. The next step was to “Slice two-thirds of the way down into the ring, at 3/4-inch intervals. Twist each slice to the right so that the interior of the slice is now facing upwards.” The picture illustrating this step wasn’t very clear, and I couldn’t find any pictures of “race track” coffee cakes on the Internet to illuminate the process. The finished result looked a bit lopsided after its second rising, since I didn’t roll the dough into a perfect rectangle (how does one do that, anyway?) 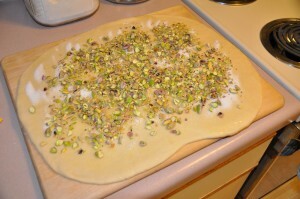 or spread the pistachio nuts far enough to the edges. 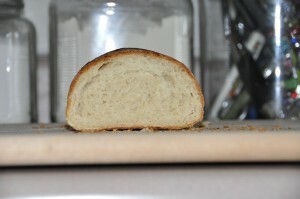 After only twenty minutes in the oven, the bread was nicely browned and hollow-sounding. I let it cool completely before wrapping in foil and serving the next day for dessert. The verdict? It was good, but not quite what I expected. Previous Beard recipes tended to be on the sweet side, such as Banana Bread and Raw Apple Bread. I expected a bread that Beard refers to as “rather sweet” to taste more sugary. 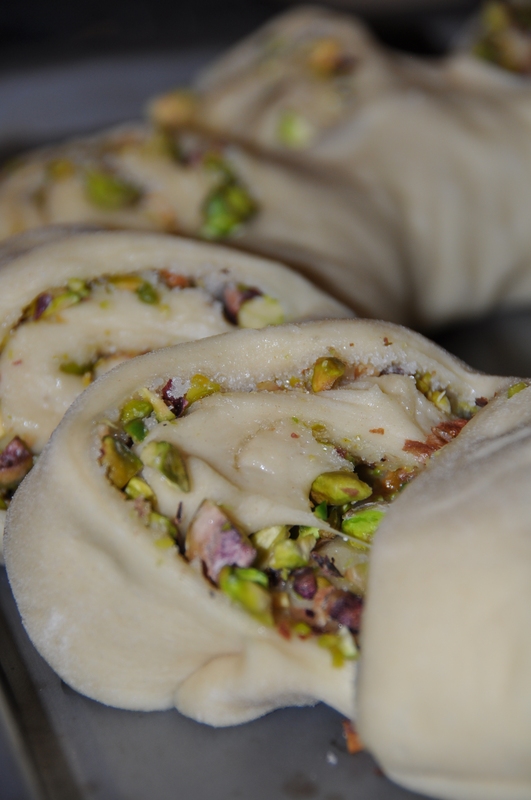 However, the salted pistachio nuts cut down on the sweetness overload, and the bread dough itself didn’t have as much sugar as I would have expected. However, I can’t complain–because it wasn’t too sweet, the leftover bread made a delicious breakfast on Sunday morning.